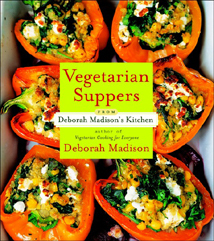 This book points right to the center of the plate with 100-plus vegetarian main dishes assuming center stage. I see them mostly supper dishes, which I love because they’re friendly, relaxed, and have a quality of comfort and ease. Some, however, are more involved and should be considered company dinner dishes. Recipes range from supper sandwiches to tofu curries, to a wild mushroom tart to black-eyed peas with coriander and greens. Wine suggestions accompany each recipe as well as tips for converting vegetarian recipes to vegan versions.